Before leaving for the school I surveyed the tree once again. The guava tree was absolutely under my control and I never left home without counting the guavas on the tree. It was a ritual I performed with utmost care, planning which guavas to pluck when I got back home. That day when I surveyed the tree, I could not help spotting the largest of the lot. It looked tempting and deserved to have immediate attention. But I chose to tell myself that the food I had just taken needed to be digested properly and kept the one on the tree for a different purpose. Laxman who stood by my side seemed to urge me with an ardent look in his eyes to get the guava and share it with him. I could not look back at him with indignation to teach him the sense of restraint as I was not quite sure of what I felt like at that point of time. I was just ambivalent about the thing on the tree. My mouth watered at the sight of the fruit making an appeal to me like a forbidden one but my mind started ticking for something else. The result was that I left the place hurriedly with a heavy mind as it was already time for the school. After the prayer was over, I began to feel uneasy. The more I thought about the lesson that the teacher had told us to prepare at home, the more I felt jittery. It was a terrible lesson which occupied the space of a couple of pages of the fattest of the books we had been bombarded with. I tried to use some of the resources at my disposal. I began to simper trying to make an eye contact with the class teacher to make her mellow. But it had no effect on her as she was busy with one of her colleagues, excitedly talking about the proposed raise in salaries by the government. She looked happy and I could not but wish she remained as much happier all the time. I spent several minutes in the class preparing the lesson and could make little progress. Then I began to think of the plan I had made. It was necessary as the teacher was very severe and had an uncanny knack for punishing her innocent students on the flimsiest of charges. All the students, including the most clamorous ones, were sitting with their eyes glued to their books ostensibly to avoid the punishment. The unnatural silence in the classroom was disturbing. But it could be discerned from the way they fidgeted in their seats and looked towards the door that they were not sure of how much they would be able to manage. Sonu Halder, the only son of a rich rice merchant was trying hard to learn his lessons and was rocking back and forth, shouting everything from the grim pages of the book. The din he was making was enough to make one deaf but his voice grew fainter. The look on his face began to change. His pudgy face began to get contorted with pain as he seemed to realize that he was not going to make it. Suddenly with the best wishes of all the students fearing for the worst, he fell unconscious. This was a scene no one among us could overlook and fail to use, though we felt very concerned about the boy whom every teacher loved to refer to as the worst blockhead of the school. We raised a hue and cry, intentionally increasing the pitch to give it the seriousness of an accident. Some of the students began to cry and bedlam broke loose. All the teachers rushed into the room to inspect the cause of the noise. In a few minutes, the situation seemed to get out of control of the teachers. Sonu was scooped up by the teacher who taught us physical education and was given several splashes of water in an attempt to bring him back to his senses. A little later when he stirred and blinked open his eyes, he ran his eyes around looking for someone. Then when his eyes fell on the anxious face of the teacher who was supposed to make us recite the lessons, he began to sob. An intense enquiry by the headmistress revealed the cause of his anguish and the teacher in question got a plain chastisement for frightening her students with the burden of lessons. Assuring Sonu she declared unequivocally that there would be no test of the lesson that day. She also became a little more lenient and allowed us to go two periods before the school was to close. I was so excited on hearing the announcement that I had goose bumps all over. The very next thought was about the guava that I intended to give to the class teacher as a bribe so as not to be an easy target for her. Now with a mind free from fear, I looked forward to having a good afternoon feasting on the ripe fruit along with some more right from the tree. The question of sharing it did not occur to me immediately though. Emerging from the school with the other students talking to our heart's content about the way Sonu fainted and things took a dramatic turn, we spent some time together splitting our sides. One of the boys proposed to name Sonu the student of the day. Another came up with the idea of playing the game of enacting a little drama, The Great Fall. 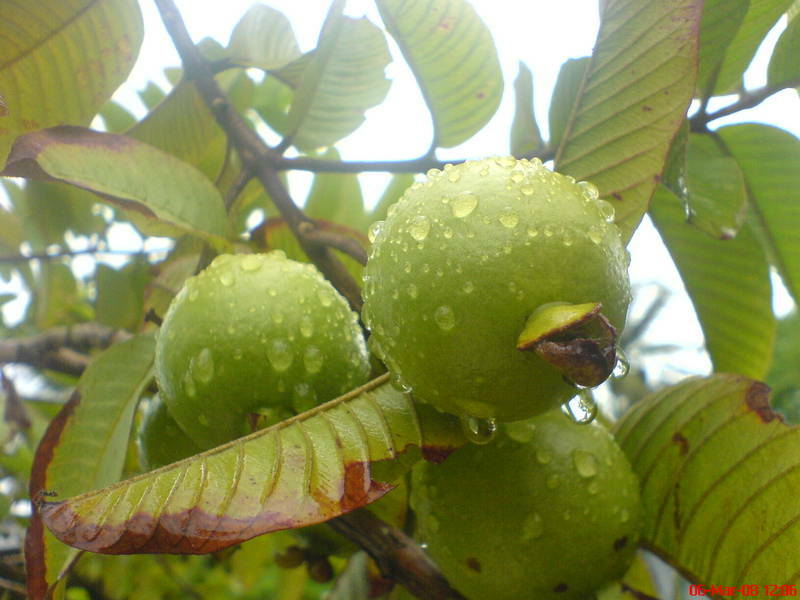 After we all nodded and dispersed, I headed towards the tree to claim my share of the guava, tempting and alone. But I was intercepted by the eerie sight of Laxman sitting on the boundary wall of the neighbouring house, eating the great fruit with his pockets bulging with some more.